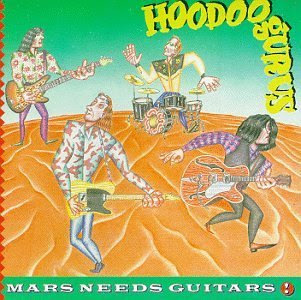 Forgotten Disc Friday: FDF Volume 1: Issue 56: Hoodoo Gurus - Mars Needs Guitars! This is a great post and looking back I am really impressed with a lot of the other posts. I remember getting Stoneage Romeos after seeing the video on 120 minutes. of Course twenty years later I start to find out about their "other" songs. This my 1st visit to FDF in about 5 months. This album reminds me of homework. Me and my brother would toss this on the turntable and the next thing you know it was lame excuse time at school. Mars along with,the first Alarm Ep, and U2's War was the sountrack to my dorky freshman year or was it sophmore.